* There is limited parking onsite at the Murphy trailhead. Overflow parking is across Hanrehan Lake Blvd at the Wildflower Early Learning Center. 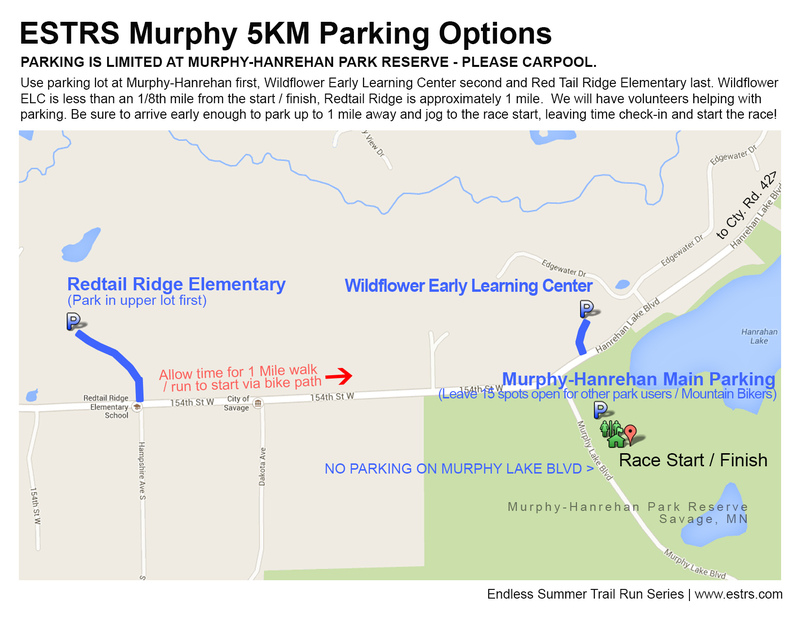 If both lots fill the final overflow location is at Red Tail Ridge Elementary School (approx 1 mile away)… so, please carpool and leave enough time to walk to the race start! This 1 mile is a great opportunity to get a warm-up and cool-down in! HERE is a parking layout map. Endlessly rolling double-track trail, lake views and a few mosquitoes and black flied thrown in to keep you moving! Murphy is one of our favorite places to run and this might just be one of the most challenging 5KM races in the entire state! Come and see how you measure up! Remember when you were young and the summer days were hot, relaxing and seemingly endless? Well, as adults we still get that but usually only on weekends and holidays… until now. The Endless Summer Trail Run Series is the brain-child of two passionate Minnesota trail-running main-stays – Rocksteady Running and Twin Cities Running Comapny. The series was created to provide low-key, low-pressure trail running / racing opportunities for people of all ages, abilities and levels of experience. Whether you are a seasoned trail or road racer, first time trail-racer, need a tune-up for your next race, need to get in some speed-work or just want to have some pizza, pop and beer with us at the finish – running one or all of the races in the series is for you. The Endless Summer Trail Run Series has garnered a strong local following and has gotten significant national media coverage as one of the best organized and most well attended trail running series in the country! 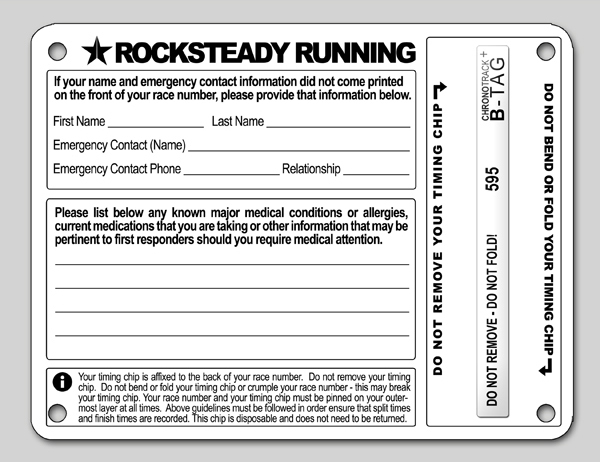 Please Note: Entry fees are not refundable under any circumstance, race registrations are not transferable to other participants, other ESTRS races, future years races or other Rocksteady Running events. Please consider these factors very carefully before registering. You can pickup your number starting at 5:00 PM on race day. If you are over 21 and would like to have a beer after, please bring your ID to check-in and you will be given a wrist-band. Due to rush hour, we strongly encourage you to leave work (or wherever you are coming from) early so as not to arrive late to the race – those who arrive after the start of the race will not be issued a number or timed but are welcome to go out and run on their own (and not cross the finish line) and join us after for food and refreshments! It’s Summer, it can be hot. Be sure to carry water if you feel you will need it, for races over 5KM we will have a water stop around the half way point. We expect that you will use your personal judgement in deciding if it is too hot for you to run. The race will be held rain or shine – however, severe weather is a different story. To date we have never called off a race early / in advance due to the potential for severe weather – hopefully, the worse case scenario would be a delay in the start time once unsafe weather conditions have passed. If sever weather were to persist after a reasonable amount of time we would call off the event. 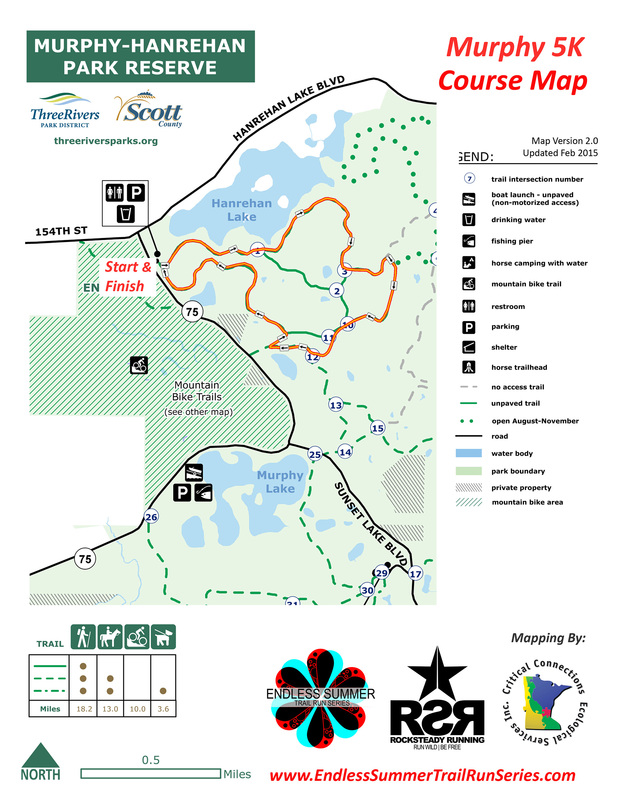 The course will be marked with orange flags, which will always be on the left hand side of the trail except in areas with two way traffic, in which case flags will be on both sides of the trail – It is unfortunate but is not unheard of at many of the major trail races that course vandalism has occurred and flagging has been intentionally moved or removed by small minded individuals – it is important that you study the course maps prior to running and try to have some concept of where you are going. There will not be an aid station for 5KM (3.1 mile) or shorter races, if you feel you will need water during the run please carry a water bottle. For races over 5KM there will be an aid station approximately 1/2 way through the course with water. Due to our past experience with people wearing headphones on trail runs such as these, we discourage their use however we won’t tell you can’t wear them . Full awareness of one’s surroundings, and the ability to communicate with other participants, race volunteers, and trail users unassociated with the event are critical to everyone’s safety. Please use common sense. Don’t do it. If you see some trash someone else has dropped, pick it up and help keep the trail clean. In order to keep this a low cost event, we don’t do t-shirts but all registered runners will receive something small, modest and super cool TBD – past years items include coffee mugs, beer “pint” glasses, stickers, patches etc. We will be serving Pizza, Pop and Beer after the race – please stick around and meet some new people – this is what this race is all about – enjoying Summer to its fullest, meeting new people and our awesome local trail-running COMMUNITY! * Please note that if you would like to have a beer after the race, you will need to show ID just as you would have to at a bar / restaurant, once you show your ID you will get a wrist-band… we prefer you have your ID when you pick up your race number but you can show it later as well. Results will live-stream to the web as soon as you cross the finish line but are not considered FINAL until a day or so after the race in the event of a missed chip read or any other type of revision. We are always looking for them – if you are interested, please check THIS out. Click to view larger map in .JPG format and download.